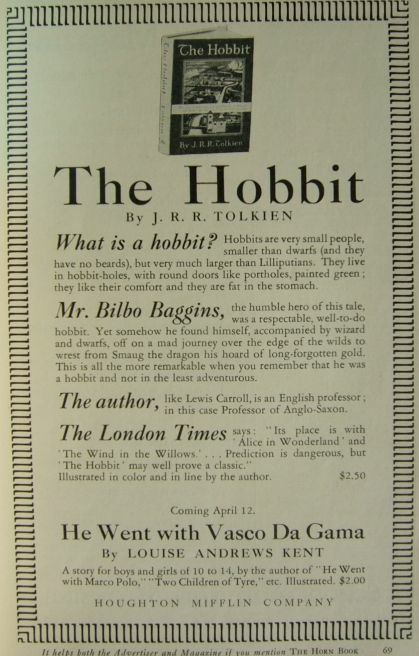 In 1938, the Horn Book Magazine published two issues which contained reviews or excerpts of Tolkien’s The Hobbit. Vintage Horn Book Magazines have collectible value, due in part to the articles on children’s books contained in each issue, which provide a ‘when published’ perspective on the respective authors, illustrators, and books, and also their use as a solid reference for the first issue price of a particular book. With that said, since pricing ephemera is an esoteric science, we cannot even put forth a bad estimate. Currently, neither of the two issues are available on any of the usual internet book market sources. Anyone have a guess as to value? 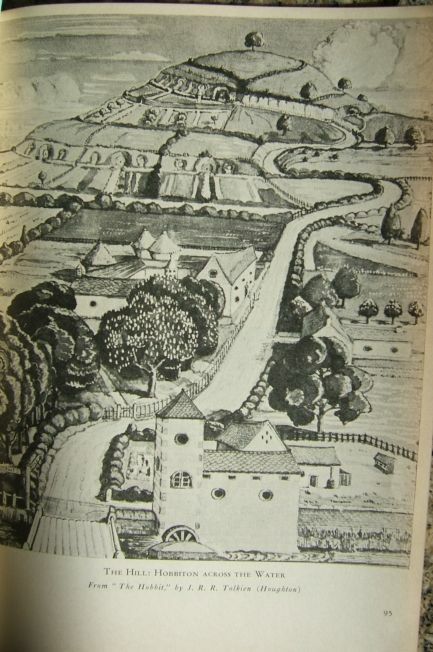 Page 95 – Full page picture of "The Hill: Hobbiton across the Water"
The New York Herald Tribune’s Prize and Honor Books. For the Second Annual Children’s Festival, the Herald Tribune judges – Mrs. Dwight Morrow, Miss Mabel Williams, Mr. Stephen Vincent Benet, Mr. Robert Lawson and Mrs. May Lamberton Becker, Editor of the Herald Tribune’s page, "Books for Young People" – have awarded one prize of $250 to J. R. R. Tolkien’s The Hobbit as the best book of the spring for younger children. The Hobbit is another book to add to this group, and we close this Spring Festival number with its opening pages. Some children will read the book over and over, and some to whom it is read aloud will find it in their memories long hence. Should any one be in doubt as to the looks and ways of dwarfs let him turn to The Hobbit (Houghton, $2.50), the book awarded a prize at the recent Spring Festival of Children’s Books as the best book published for younger children in 1938. The Hobbit is good vacation reading for older children as well — for any one with imagination and a zest for adventure. A rich book, and a rare, and a book to share, is The Hobbit by J.R.R. Tolkien, who sadly enough is a professor of Anglo-Saxon at Oxford, which means that he may never find to to write another children’s book. First edition copies of The Hobbit can see for near $100,000. For first edition points, see Bookride.